Prime Minister Ranil Wickremesinghe yesterday ruled out the possibility of “a hybrid court” stating it was not politically feasible. Instead the Prime Minister proposed a ‘Truth and Reconciliation Commission’(TRC) as the best option to deal with post war issues of the country. The Premier was addressing the ceremonial inauguration of “National Law Week 2017” at the auditorium of Bar Association of Sri Lanka (BASL). Wickremesinghe observing that the establishment of a “hybrid supreme court” may require a referendum, said he raised this point with the UN Human Rights High Commissioner as well. “Can you actually establish a hybrid supreme court? If you bring in an Amendment for that purpose, is the two thirds majority of Parliament sufficient? What if the court decides that it requires a referendum?” he questioned. “The European Union (EU) itself knows the dangers of a referendum,” the Premier added referring to the much talked-about EU referendum which paved way for Brexit. “We will have to seriously rethink it. If the court rules that we must go for a referendum we will end up in serious trouble. Hybrid court is surely not something we can campaign for. It is certainly not practical. We are now looking at a new mechanism,” the Premier said. “The Office of Missing Persons (OMP) has already been set up and a Special Counsel to be appointed. We are now considering a TRC which I think can resolve many issues. The South African experience, the strengths and weaknesses of that process, will be studied. Generally all parties are in agreement with it in principle,” the Prime Minister pointed out. The Prime Minister pointed out the TRC would be a cornerstone of achieving reconciliation, but at the same time stressed that a basic agreement on new Constitution is needed for the setting up of TRC. He pointed out the extremists on both sides of the divide would reject the TRC, adding that the Centre would have to deal with that. “Any criminal procedure cannot be long drawn. It has to be fast. We have fought too long. We have to find a quick way to compensate for those suffered and met with injustice. We have to address the issue of missing persons,” the Prime Minister commented. 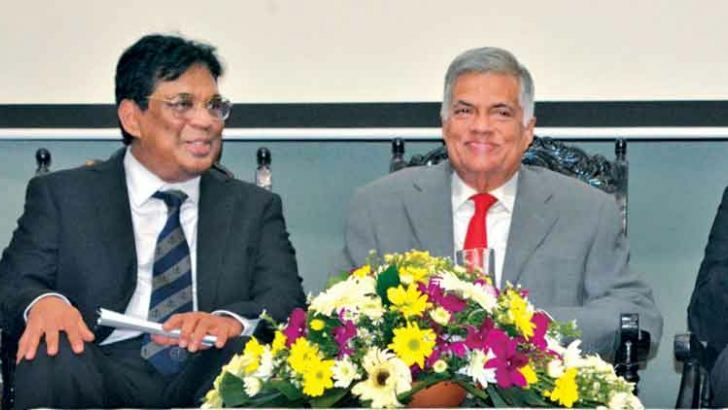 Prime Minister Wickremesinghe, reminding the debt the country has to repay in the next 10 years, noted the importance of thinking of a mechanism to ensure that the country meets the expectations of the international community,” Prime Minister Wickremesinghe said. Referring to the ongoing UNHRC sessions in Geneva, the Prime Minister said the Sri Lankan Government is negotiating a roll over in the next two years with regard to undertakings mentioned in 2015 Resolution. “The reference to a Hybrid Court was because the people lacked faith in the local judicial system, but over the past two years we have restored people’s faith by upholding independence and integrity of court. The smooth transition of Chief Justices was an example. Last week the Constitutional Council and the President worked together for this purpose,” the Prime Minister added. The Premier also used the opportunity to congratulate newly appointed Chief Justice Piyasath Dep, who was also at the head table making his first formal appearance as the CJ, commending him as a person who deserves the position of that high rank. The Premier stressing that the independence of the judiciary should not be compromised in anyway, observed that the country’s court system is older than the political system and that most of the members of the first Legislative Council were lawyers. The Premier said the Government is now negotiating with the European Union to regain the GSP plus facility, and observed this trade concession was given based on good governance practices. “We lost it because there were questions over the independence of judiciary, media freedom and independence of election system over the past years. Last two years we have been able to re-negotiate to regain this concession,” the Prime Minister said. “Now we have to ensure that our laws are compliance with international standards and international human rights practices” the Premier noted. The Premier also took the opportunity to reiterate his stance over the International Covenant on Civil and Political Rights (ICCPR) and its Optional Protocol to which Sri Lanka is a signatory party. “Previously, I raised the same in Parliament and asked the Speaker to give a ruling. The ‘Singarasa case’ was a departure of the accepted practice. The judiciary cannot intervene into Parliamentary affairs. However, the ICCPR cannot impose any judgment on us. It can only recommend and it is up to the Government to decide whether to accept it or not,” the PM said.